Birmingham based DJ and producer, Sam Redmore, is collaborating with Spinx and The Mighty Magoo to present Tropical Sounclash at the Hare & Hounds on Saturady 28th October. Doors open at 9pm with music running until 2am. Entry is free before 10, with a pay on the door charge of £5 thereafter. For direct event info, including venue details, click here. Many may be familiar with Sam Redmore’s eclectic style from his previous music event Freestyle, which spent many years as a familiar feature of the Birmingham music scene – starting at The Bull’s Head, before moving the Hare & Hounds in 2014. Since then, Redmore’s star has continued to rise, releasing music on 2 Dogs and Felt Tip, alongside remixing numerous artists including DJ Vadim. Freestyle was a showcase event for local hip-hop luminaries, while Redmore’s remixes began to regularly feature on BBC 6 Music whilst the man behind them made increasingly frequent guest appearances on Craig Charles’ Funk & Soul show. Birmingham Review interviewed Sam Redmore back in 2014, when Freestyle moved to the Hare & Hounds, where he discussed his desire to “support local artists, and the music scene in general”. Three years to the month later and Redmore clearly feels the time is now ripe for a new, fruitier fixture to the Hare’s already well-respected events calendar – adopting the name Tropical Soundclash. To deliver this, Sam Redmore has reunited with co-host Spinx for the first time in over a year, an artist also known for his soulful and varied sets who is fresh from a summer schedule of festivals including Shambala, Green Man, Samphire and Glastonbury. The pair will be joined by the local percussionist Mighty Magoo, who will be playing on live percussion at the Tropical Soundclash events. Neither Sam Redmore not Spinx are new to the world of music promotion, but Tropical Soundclash is a shift away from Freestyle’s familiar hip-hop focus which may surprise some of their more regular crowd. Perhaps anticipating people’s curiosity, but also showing his flair for promotion, Redmore has put together a Spotify playlist to tempt the uncommitted – giving some weight to the promise that Tropical Soundclash will combine ‘afrobeat, highlife, samba, salsa and more with house, broken beat and bass’. 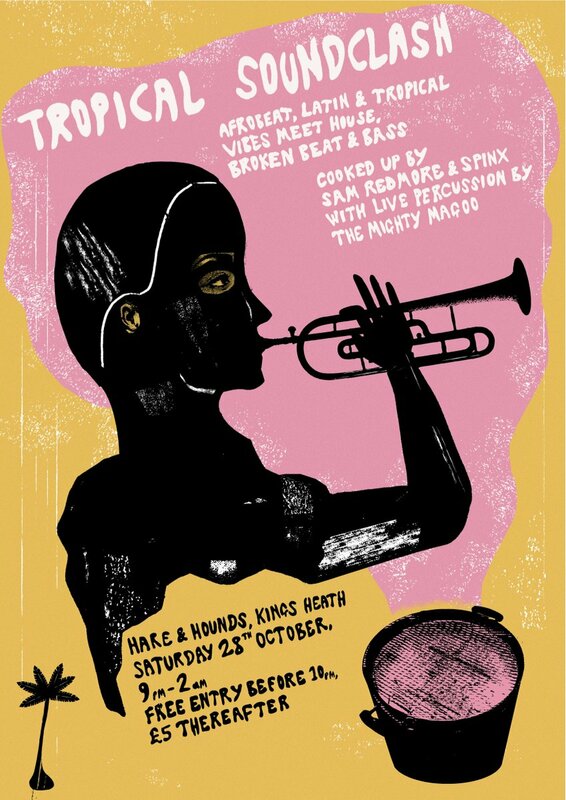 Tropical Soundclash comes to the Hare & Hounds on Saturday 28th October, running from 9pm to 2am. For more on Tropical Soundclash, including venue details, click here.